Recognised by horror legend, H P Lovecraft, Irvin S, Cobb’s Fishhead impressed him to write Shadow Over Innsmouth, while The Unbroken Chain gave him the idea for The Rats in the Walls. 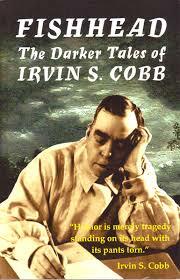 Collected for the first time are fourteen of Cobb’s stories starting with the influential Fishhead. 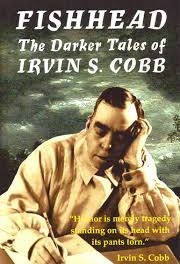 While alive, Cobb was a celebrated writer in the Lovecraft vein, but nowadays he might have long since been forgotten due to the resurgence of Lovecraft in new horror fiction. Cobb’s career began at the Paducah Daily News, then the Louisville Evening Post, not letting his short education put him off, he excelled in New York where he continued his career, covering the Russian-Japanese Peace Conference in Portsmouth, New Hampshire, catching the attention of Joseph Pulitzer who had him employed at the New York World becoming the highest earner as a reporter. As Lovecraft mainly wrote about the darkness in horror stories and novels, Cobb’s contained a lot of humour and were published in top magazines of the day. The main reason I thought this collection has been published is due to the interest Lovecraft had in Fishhead and it is easy to see why. Fishhead lives in Reelfoot and teams up with another hybrid to get revenge on the murder of a fellow friend. With all the animosity from the other residents (like in Lovecraft’s stories) they exist among the hatred. Though this story is short, it is enough for Lovecraft to build his Innsmouth location and get a feeling for the mutations of the Old Ones and Deep Ones that would follow. Another interest for Lovecraft was The Unbroken Chain as it gave him the idea for The Rats in the Walls and tells of two men talking about what being a Native American means in society at that time and the implications of being non-white in an age where such a thing was unaccepted. It is interesting to see that Cobb has more about him than the average writer as his work has also been turned into movies; Judge Priest, The Sun Shines Bright, Peck’s Bad Boy and The Woman Accused, to name only a few of what exists. As well as writing books that were in Hollywood made by movie making legend John Ford (famous for his Westerns), he starred in a few; Pepper, Everybody’s Old man, Steamboat Round the Bend and Hawaii Calls. Cobb’s history speaks for itself; his stories like Lovecraft’s are dark, doomy and intense at times. His characters want a life of their own in a strange setting, trying to resist their fate even if they can’t change what life has already been chosen for them. There is a sense of fear of the future in some of the darker stories, so it’s great that there is some humour in the rest of them.